Fido’s got a friend in the VPD. 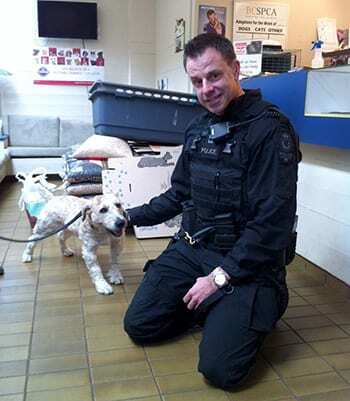 Still busy with many of the 66 dogs and puppies seized from a Langley puppy mill in February, Vancouver BC SPCA Branch staff were thrilled to hear that the Vancouver Police Department’s K9 unit is donating $1,300 of their overtime hours to help the dogs still in BC SPCA care. And they’re challenging their colleagues in other canine units across the province to do the same. Fincham recalls emailing the BC SPCA when the news of the puppy mill seizure first broke in February, to offer to foster one of the 66 dogs seized from the puppy mill, where they were kept in deplorable conditions, and says it’s natural for many to want to help when such horrific news breaks. Vancouver BC SPCA Branch manager Charlotte Ellice was pleased to hear the news. While several of the 66 dogs and puppies have now been adopted, many more will still need loving, forever homes. The Vancouver SPCA is now accepting new applications for the remaining adult dogs, which include Bernese mountain dogs, Wheaten terriers, Portuguese water dogs, and poodle mixes. Please email applications to vancouver@spca.bc.ca.